To help my business manager (aka wife) with invoice preparation I wrote a very simple date addition calculator. Given a date, it adds a number of days to it, so you can calculate due dates for invoices. When I told my colleagues about this they each had different but equally 'helpful' alternatives I could have used. Why not just use excel? Why not use the DATEADD function in SQL? Most people have SQL Management Studio open all the time, don't they? Why don't you use Invoice Place? I like writing my own software, and the little details are the things I love the best. 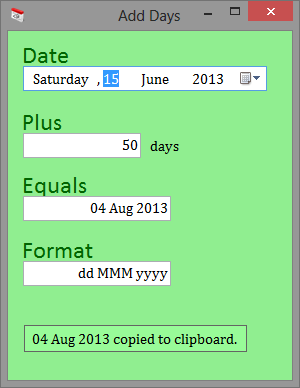 The moment you change the date, or change the number of days to add, or change the format, the result is immediately copied to the clipboard. Anyway, if it helps you so be it. No support it offered, and of course I disclaim all responsibility to the best of my ability. Writing your own solutions to your own problems is very satisfying.